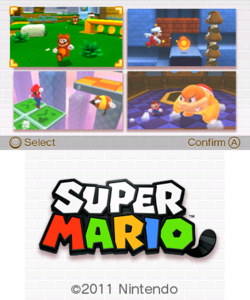 This page details one or more prototype versions of Super Mario 3D Land. This demo was featured at E3 2011 and later 2011 events. The demo consists of four levels, all of which show different levels of completion. Screenshots for everything that isn't just a screencap from the YouTube video. Get demo/final images for all. Check for early versions of music, levels, and other assets within the ROM data. Mario Wiki also has some documentation on this demo for stuff that is not in this video or what I may have missed. Merge some of this information. Also, examine the Kakariko village sequences. See if they play in-game. In addition, there are unused graphics and text in here. On the 3DS Home Menu, the game's banner has a build date of May 26, 2011 at 13:50:23 (1:50:23 PM). This is roughly three and a half weeks prior to E3 that year (June 7-9, 2011). Screenshots. Also, can the early 7-2 level be run? There are three files correlating to early versions of level 7-2. There are simple textures, showing its primitive state. There are also two files, both of which are the same, of a very early 8-5. Only the platform on which Mario spawns on is present. The game itself does not have a proper title screen. Starting it jumps you directly to the level select. The title music is missing as well. As well, the unused Yoshi sound effect can be heard when jumping on note blocks. "Fast" versions of music (when the timer speeds up) start off with the main melody of the track, rather than starting the whole song over. The game over music has an extra instrument: A banjo! The first level's theme sounds...different. The note blocks behave differently in the demo, as well. If Mario simply bounces on them, they'll play random sound effects, including this Yoshi sound. If you jump while on them, they'll play a note scale, and if you do this repeatedly, the pitch of this note scale will change. If you ground-pound on the note block, both will occur. The game logo used on the level select is not the game's final logo. This would not be revealed for a few more months. Sound effects are different. Sounds for the star coins do not change with pitch whenever you get another coin. Gold flagpole goals are not yet implemented. 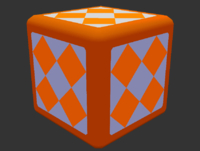 Orange and purple warp boxes are different. 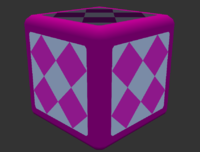 In the demo, the purple boxes warp you around to different parts of the level, while orange boxes take you to minigames. In the final, the coloring was swapped. As well, the minigame room has a very basic red/white design, nowhere near as polished as the final. There is a single ? box in the minigame room that has an infinite amount of coins in it, but no star coin. Entering pipes shows the R button graphic in the demo, but the L button graphic in the final. Both buttons allow you to enter pipes, though. The particle effect when the flag hits the top of the flagpole differs between games. The demo has five red stars, while the final game has a halo and sparkles come out from the top of the flagpole. When tallying up the remaining time, the Clear Time is not shown. Sound effects for when coins are revealed are not present. Pause Menu background is a checkerboard design instead of a solid yellow color. As well, this checkerboard pattern is applied translucently on the top screen. Adjusting the 3D slider while in the Pause Menu only affects the checkerboard overlay. Fire Flower's model are different. The leaves did't fit the official design and the model was ported from Super Mario Galaxy so they were remodeled to fit the official design and made it different. 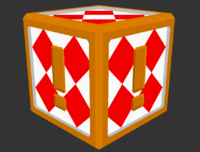 The Super Mushroom's hold item image had additional shading added to its front. The Game Over screen's "GAME OVER" text is colored like the game logo's text is. As well, it does not show Mario falling and landing on the ground. The background as well is a sandy-looking texture instead of yellow. The hold item on the touch screen is higher up on the touchscreen in this demo. 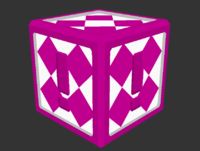 Powerups do not pop out of the boxes and fall to the ground, they stay on top of the box they came from. Mario has two distinct rolling animations and accompanying sounds; one when walking, the other when running. Mario will perform a roll whenever a shoulder button is pressed while he is moving. Camera locks angle when adjusted with the left/right on D-Pad. Fire and Ink Piranha have different animations when firing either fire or ink respectively. Mario does not move his head to look at ? blocks. Mario does not produce an air trail when he jumps or turns while jumping. After destroying crates, there is nothing that remains of them in the demo. In the final game, there are boards left on the ground by default, but there is a setting that disables this function. Also, you can't destroy crates by running into them while invincible in the demo. The maximum amount of lives is 99; this total can be obtained by performing the 1-Up trick after kicking the first shell in 1-2 where the Goombas are, and when it stops by jumping on it while facing the camera. Koopa Shells have some differences. If kicked or jumped on, they slow down after sliding around for a while. In the final game, they slide around indefinitely. They don't "kick-start" other Koopa Shells on contact. In fact, they don't interact at all; they pass right through each other. They don't wobble power-ups or activated Checkpoint Flags. They don't activate Checkpoint Flags. Fireballs just disappear if they touch a shell, rather than bouncing the shell. There is no 1-Up bonus for doing multiple "kick-ups" with your tail. They bounce off crates on contact, smashing them, rather than smashing through them. There is no combo for multiple crates destroyed by a shell in one go. They do not smash when falling down a pit, so they just disappear. Level time is 300 seconds as opposed to 500 in the final. The flowers on the top of the bush around the starting area are a darker shade of red. Fuzzy dandelions are not implemented. The castle pillar at the very beginning of the level behind the starting point is white in this demo, while it is gold in the final. There are no Goombas on the steps leading down into the level in the demo. In the demo, there is a round patch of sand that has a Goomba on it. In the final, the Goomba is removed and three ? blocks appear above that sand patch. As well, the lake beside that patch of sand, as well as the floating block with coins in it were also removed. Beside the Fire Piranha Plant, there are no double-stacked Goombas in the demo. Additionally, the grass around him is a single color in the final, while there is a dark ring around it in the demo. As well, two platforms and a 100-second timer increase behind this Piranha Plant were removed. After the three fake and one real Goomba, the music note blocks in the demo turned into dotted bouncy blocks in the final. As well, the fence just below the Piranha Plant here has three pegs in the demo, but two in the final. To the right of this Piranha Plant, a wooden peg was turned into a fake green pipe. Up on the top where the note blocks take you is the first Star Coin of the level, as well as green bushes. 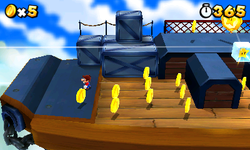 In the final game, there are six coins here, as well as blue and yellow flowers. While up here, looking at the side of the castle that the latter half of the level is situated on shows a slightly unfinished design. From here, in the demo one can see a 100-second timer increase as well as another note block. In the final game, that all turned into a blue P-Switch. 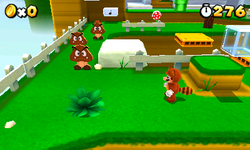 Above the fake pipe, there is a stack of five Goombas in the final. It's limited to one in the demo. As well, there was a powerup block and a brick block there in the demo, all of which removed in the final. The layout to the room for getting the demo version's second coin star is completely different from the final game. As well, there is no tile for being able to change the view of the room, it's done automatically when you get to a certain point in the demo. The way the camera moves is different too. In the final, it goes from an isometric perspective to a view from the right-hand side of the room, while the camera moves up to the top of the room in the demo. Additionally, the 3D sign on the bottom-right hand side of the screen to indicate whether 3D is on or off is non-existent in the demo. 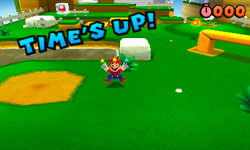 In the final, there are three fake 1-Up Mushrooms. In the demo it is a brick block. The area where this brick block is and how it leads up to the steps to get to the area under the lifts is also differently laid out in the demo. 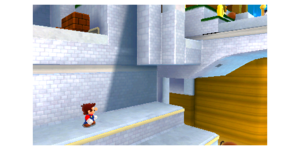 On these steps is a coin in the demo, but a Goomba in the final game. Where the first crouch hole is in the demo has a bunch of brick blocks to attempt to hide the crouch hole. In the final game, it's left in plain sight. The yellow outlining on the opposite side of this hole after the hidden 1-Up is not in the demo. As well, the half-way flag is just after this point in the demo. At the first set of lifts after the halfway point in the demo, there is a small cove in the wall on the way up the steps. This is not present in the final. After the first set of lifts, the golden brick pillar has a different texture between the two versions. On the left side of the pillar in the demo, a ? and brick block are also there, while not in the final. After these blocks are regular lifts in the demo. In the final, they are dotted bouncy blocks. In the final game, at the top of these bouncy blocks is a warp block to bring you to a small platform with a green platform. This is optional to do in the demo. When hitting the green ! pad, there are no extra sound effects to show the appearing coins as well. The safe panels' design is the same between the two games. However, the unsafe panel's facial expressions change. In the demo, they have an o= design, but in the final have more of a D= design. There is also no tick-tock sound to represent that you're being timed. As well, there is no sound effect or applause for collecting all the coins that appeared. There is a dark green edging around the water in the demo, but was ultimately removed later on. Tanooki Mario's tail doesn't interact with water. In the final game, the Tail Wag move creates eight distinct water pellets that all individually ripple when they hit the water. The sound effect of Mario running through shallow water is reminiscent to the same sound from Mario 64 but with a different pitch. There is a brick staircase leading to the flagpole in the demo. This was changed to green face panels and a dotted bouncy pad. There are also three Piranha Plants near the flagpole in the final game to gain the player additional coins that are missing in the demo. Similar to 2-1, the brick pattern is different. Camera angle at the start is different. Demo is more at a 45-degree angle, while the final game views the area almost directly on the side. The demo has a different land formation than the final. The demo has some ridges and coins on them, but the final game has flat land as to allow for a Ball 'N Chain. As well, two aesthetically-placed pipes were removed in the final game. Torches are fairly unpolished at this stage. The texture is flat and the faces are simple. Where the first three ? blocks are in the demo only has one Goomba in the demo as opposed to two. To the side of these crates is a gap in the demo. It's been filled up in the final game. In the demo, the first Star Coin is in an alcove behind the rotating platform. It was moved to a position just behind and to the right of the Inky Piranha Plant in the final game, removing the need for the alcove. The demo has only one long ? block as opposed to two in the final. There is also a green shell here in the demo that was removed. 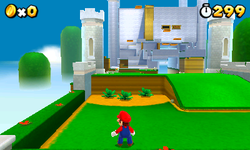 Where the small alcove is that has the L-shaped set of brick blocks, the demo has a limited head space for Mario here of just two blocks. The final game removed that to allow Mario to Ground Pound here. After the halfway flag, there is a P-Switch in the demo that reveals a 3x3x2 array of coins. In the final, this P-Switch was replaced with a single coin that activates a coin trail. In the area after the coin game, there are two blocks that are hidden and are revealed by jumping at the coins in the final game. These are not here in the demo. The demo has Paragoombas flying here because of the change of topography, the final game has green Koopa Troopas. There is an additional set of moving platforms after this area. The warp pipe to the left of the Inky Piranha Plant was removed. The moving platforms used in front of the Inky Piranha Plant in the final game use the formation of the additional moving platforms that are in the demo. There are four Ball 'N Chains on the last stretch as opposed to three. The position of the warp pipe to lead the player out of the underground is different. In the demo, it's in the middle of the last area of the level on a raised portion of ground, whereas the final game removes the colored bar and places a wall there, to which a warp pipe is affixed. The area where the goal flag is has a dirt path cut into the grass. However, the demo has a permanently-fixed pipe, whereas the final has a pipe that comes out, then disappears after Mario leaves. The position of this pipe is different as well. The demo has the pipe directly below the flag pole, whereas the final has this pipe below the lifts that lead to the flag pole. Interestingly, the dirt path was never updated to accommodate for this change. The final game has the same dirt path as the demo, so there is a portion of the dirt path that looks like something should be there, but there isn't. However, since the demo has a set of dirt blocks leading to the goal post, the dirt path was extended underneath when the lifts were added (See below). The path leading up to the flagpole is different as well. 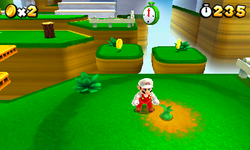 The demo uses dirt blocks with an Inky Piranha Plant, whereas yellow lifts and three coins are used in the final game. Mario kicks up gravel while running on the wood planks. The one-way "!" transport boxes to and from the 1st Star Coin only appear once. Long-jumping back to the location will strand Mario. The "!" Box returning Mario to the main platform regenerates in the final game. 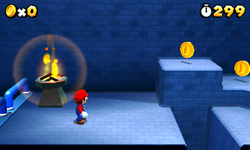 Platform with the first Star Coin does not have a flame obstacle. Long "?" box does not exist proceeding the second Star Coin. 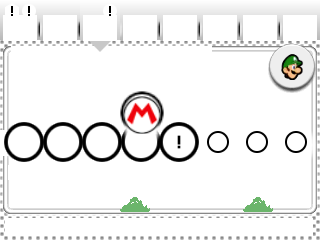 Bullet Bills do not spin in the opposite direction when Mario hits them with his tail in Tanooki form. Instead, they flip vertically and are defeated instantly. Regular pair of Bullet Bill launchers precede the pipe to the Boom Boom mid-boss fight. Raccoon Bullet Bill appear in the final game. Platform surrounding the Warp Pipe to the Boom Boom boss are slightly different. The platform where the Warp Pipe sits is slightly sloped at the end. 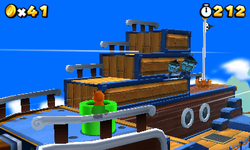 The area to the back of the ship doesn't have any railing and the platform leading down to the secret area with the third Star Coin is slightly smaller than it is in the final game. Room where mid-boss takes place is slightly different. The room lacks the red outline between the wall and the purple floor that appears in the final game. The center of the room is also mesh where the sky can be seen underneath it. The final game replaces it with brown tile. Camera pans up more when Mario jumps on the pipe leading to the Goal Post. Mario enters the area with the Goal Post from the furthest most left part of the area. Camera does not pan up to show the Goal Post. Light fixtures without collision data appear before the Goal Post on the exterior of the airship. Goal Post design resembles a normal level's and not the larger variant seen in stages with boss fights. Videos! And perhaps a Glitch/Bug page! There are some glitches in this prototype version that were rectified in the retail release. At the area with the halfpoint flag, if you have the Tanooki Suit, you can wall jump and get high enough to escape the level's bounds. Unfortunately, there's nothing much of interest outside of the level, all you do is fall to your death. This was fixed by adding an invisible barrier at the top of the level. By standing in just the right position on certain corners and edges, Mario will clip into the corner, and will rapidly switch between his "falling" and "standing" animations. This was fixed by adding a little more collision data to most corners, causing Mario to be pushed out slightly from corners, and to fall off of certain edges instead of clipping into them. When using transportation boxes (2-1 and 3-3 in the demo), you can still make use of the reserve item on the touch screen. It will pop out wherever Mario is at the time, which means the item can be lost if the platform under the block disappears. This was fixed by not allowing the player to recall a held item while using a transportation box. If Mario rolls or crouches off the edge of a platform and presses a jump button in mid-air, he can jump in mid-air. However, no height will be gained if the Circle Pad is being pressed in any direction when a jump button is pressed. There are references to streams in the RomFS that are not present in the game. Attempting to play them will crash the game. What's worthy of note is that "StmTitle", presumably the title screen theme, was supposed to be stored externally in the RomFS, as per this list. In the final game, this stream is stored in the game's sound archive file. Perhaps is this from the 3DS version of Ocarina of Time? There are two song entries in the sound data file, both of which correlate to the same sequence file, that of which is Kakariko Village's theme from The Legend of Zelda: Ocarina of Time. A simple sound, perhaps indicating a finished test. A simple song, whose two tones never stop. A simple song, similar to above, but lower in pitch. The first of many parts to a short song. Another part of a short song. Same as above, but with a cymbal and a few additional notes at the end to continue into the next part. Yet another part of the short song. The part where the song comes to a crashing halt. Interestingly enough, when properly stitched together, they create a short remix of the Underground theme. Convert the versions from the final for comparison (And use compare templates too), as well as convert fast versions. The main theme has some differences between the demo and final. The demo version has slightly different instrumentation, such as louder trumpets. These differences also affect the fast version. The beginning of the Super Star theme has less bass, as well as some additional sound effects. Now with 25% more banjo, the last parts of the theme has no banjo in the final. The demo version's miniboss theme is not an original composition, it's actually the boss theme for Peewee Piranha from Super Mario Galaxy 2. An much less detailed version of the logo with 仮(temporary) written on it can be found in the game. It is similar to the logo used at the game's announcement at Game Developers Conference 2011, which has a tail and lacks the "temporary" label. A very primitive staff roll, containing only "制作　東京制作部"(Produced by: Tokyo Production Division and "おわり"(The End). 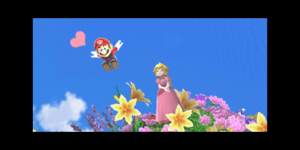 A cropped version of Super Mario Galaxy 2's Wii Message Board image for when you beat the game, with a heart inserted. A barebones course selection screen. A very early screenshot of the game. This page was last modified on 2 April 2019, at 07:16.